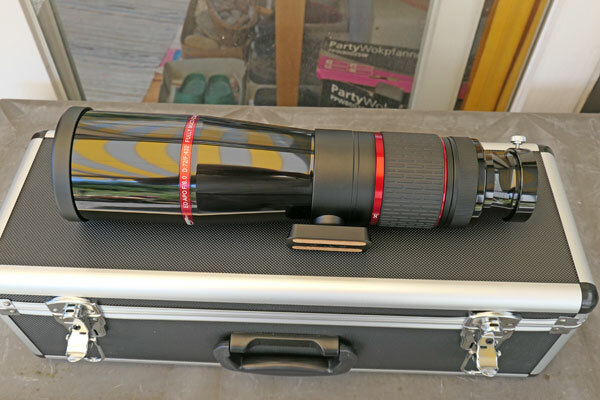 On this page I provide some information about my 2.8" Omegon apochromatic refractor Pro APO AP Photography Scope 72/432 ED OTA (purchased on September 8,2018 at the AME2018 astronomy fair, received on September 11, 2018). For simplicity, I will mostly call it (Omegon) PS 72/432 or just PS72. 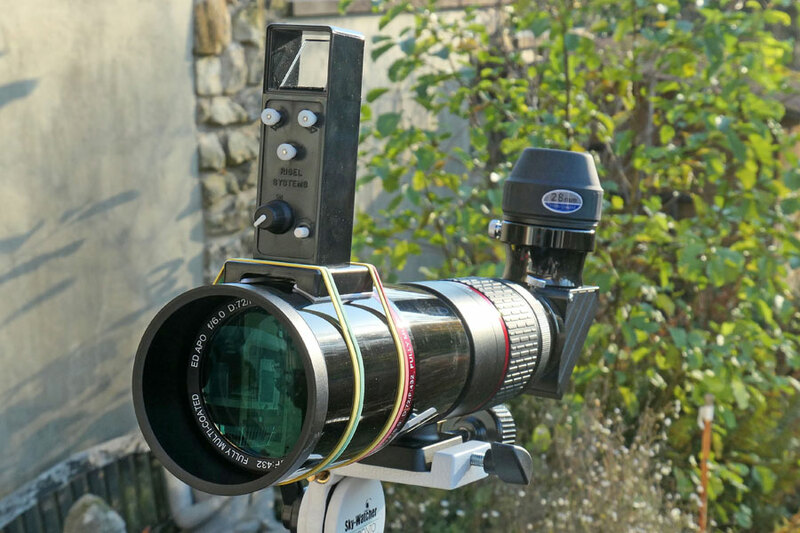 Note: Thomas Gade found identical versions of Omegon, SNYPEX (as Knight PT 72mm or Snypex Digiscope) and Teleskop Service as TSED346R. Refractors are praised again and again for their sharp and constrasty image, but also criticized because of their color aberrations. Only refractors with very expensive glass seem to be free of color aberrations. And not always seems too be "ED" inside where there is "ED" written on the tube... Although I have no experiences with refractors so far, the praises that I have read have enticed me again and again to purchase one. 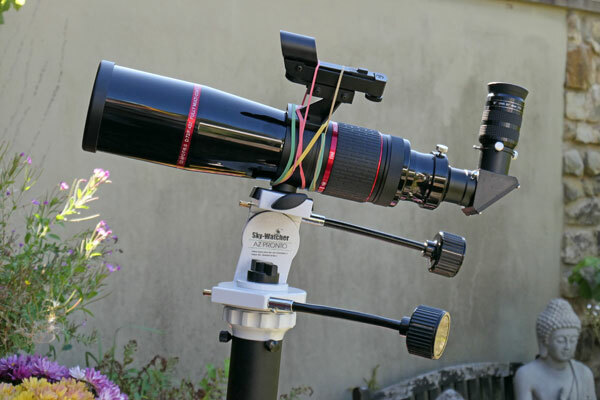 Every time I found a cheaper refractor on the Internet, I called my astronomy dealer and asked him for his opinion on the respective device. And he advised against it again and again because of the strong color aberrations, so that I have never purchased a refractor. 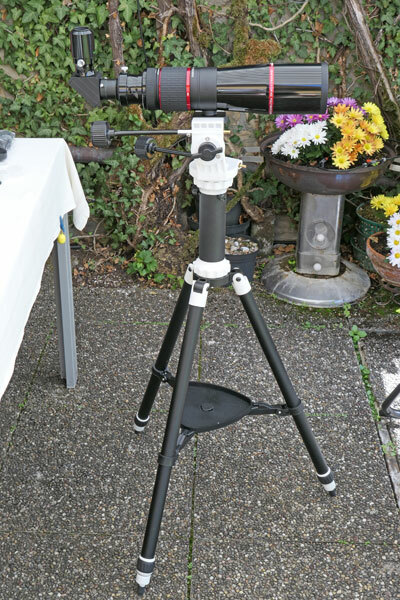 But now I bought one, and this is how that happened: At the beginning of September 2018, I visited the AME2018 astronomy fair in Villingen-Schwenningen and came across a lot of small refractors, whereby my wife and I especially liked the Omegon refractor PS 72/432 ED. 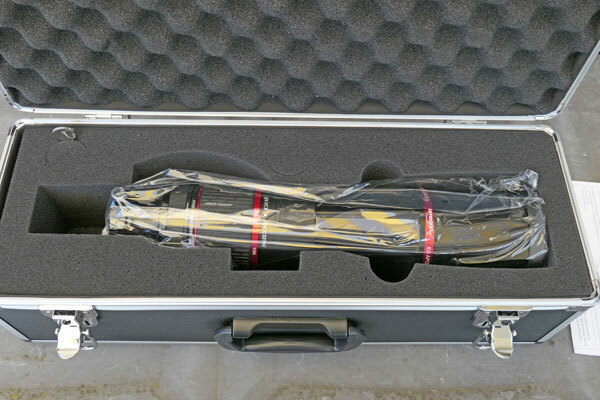 Again, it had an "ED" on it and in its name, but with a regular price of almost 500 EUR (formerly 600 EUR) it was probably not really to be expected that the optics is free of color aberrations... After some back and forth, I tried to get some advice, which was not easy indeed. 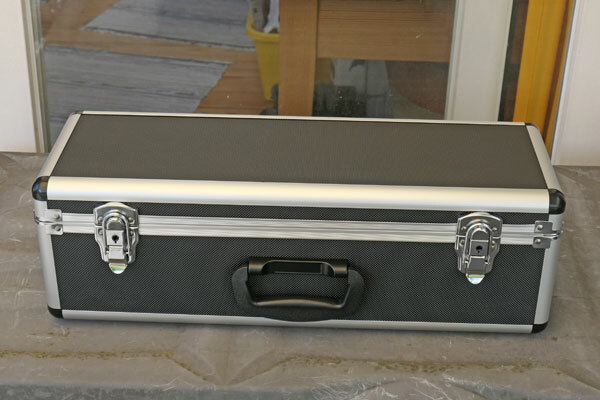 The salesman that I finally spoke to did not really know anything about this special device, which I noticed soon, but also later, when I read tests of the device. 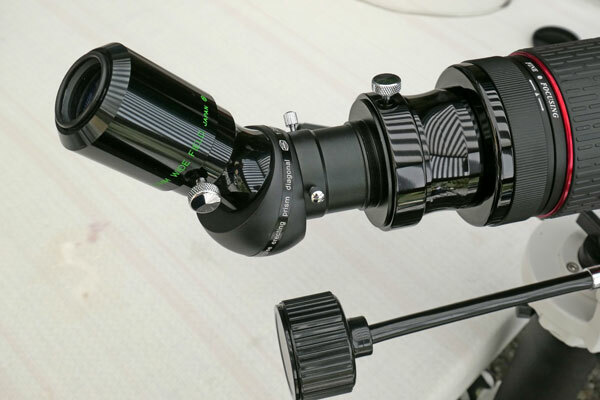 After further back and forth, I finally decided to order the refractor, also enticed by the fair rebate, because we liked so much how it looked - also because of its special focusing mechanism, which later turned out to be a "helical focuser" (internal focusing). 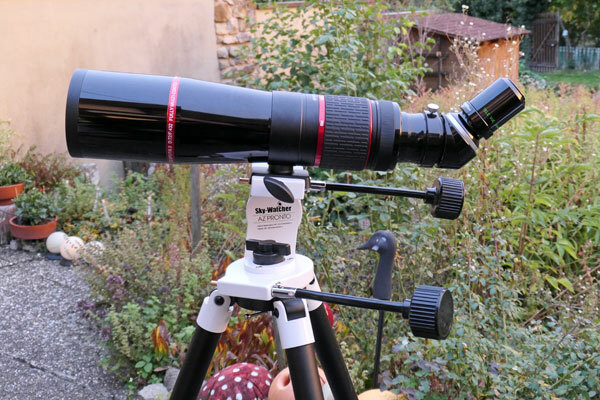 In the Abenteuer Astronomie test, the first problem that I will have to face came to light: the device has no viewfinder and a adding one is not possible at all! Gade overlooks this discretely... Maybe something can still be done??? 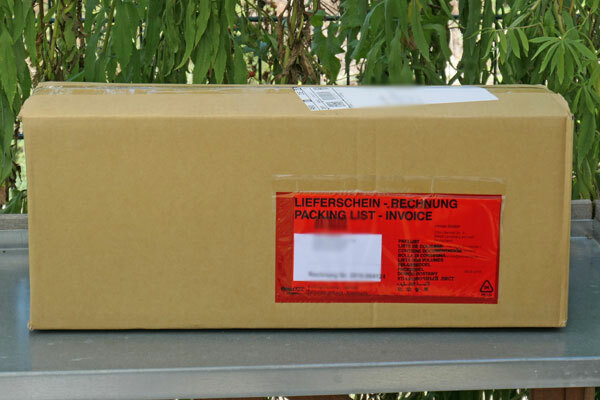 When I called the dealer and asked for a solution they recommended using the Rigel Quick Finder. The second problem, which probably will not hit me that hard, is that the Vixen rail is a little short and not movable (the latter can be a problem when using heavy cameras). 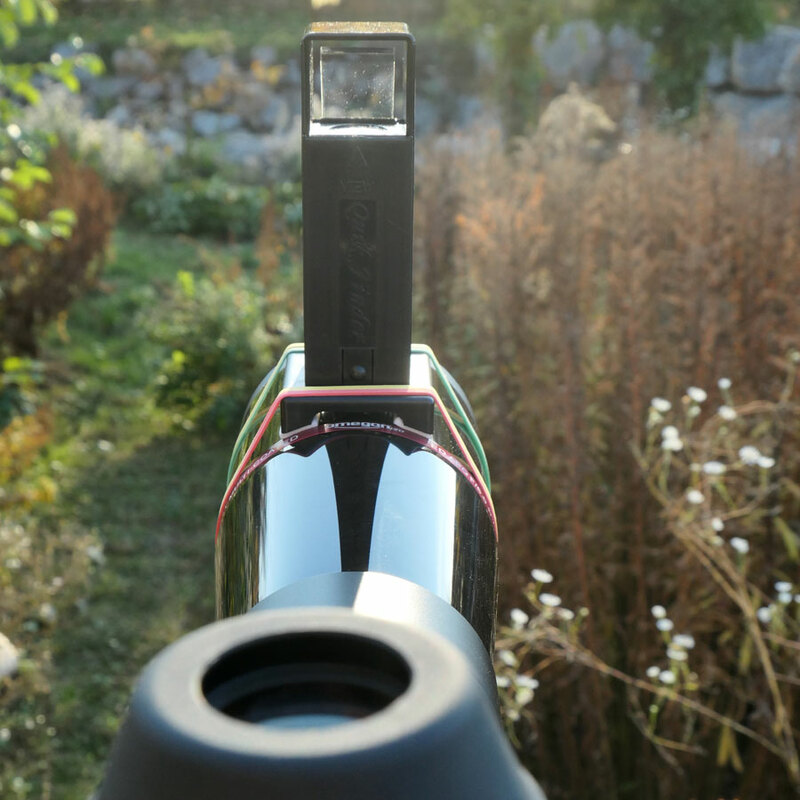 Gade furthermore complains about the sensitive varnish and the rubber armoring of the larger focus ring, but otherwise both testers evaluate the optics as better than I had feared... 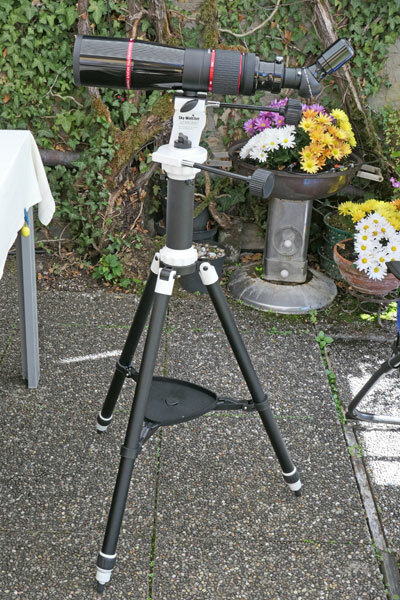 This made me curious to see how this refractor would prove itself as a travel telescope and a telescope for "fast-use," especially in comparison with my Heritage 100P. 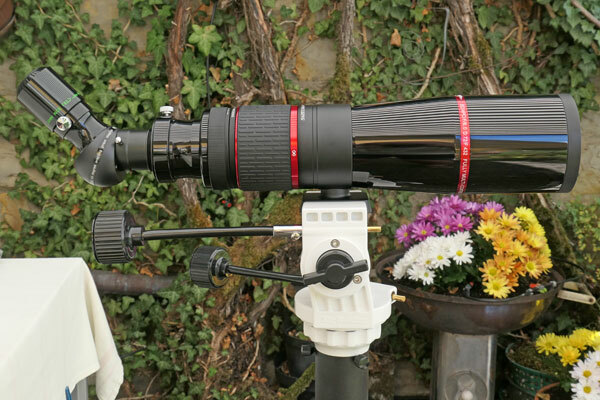 As I knew soon after the purchase and before I got the telescope, the Omegon PS72 has no viewfinder shoe. 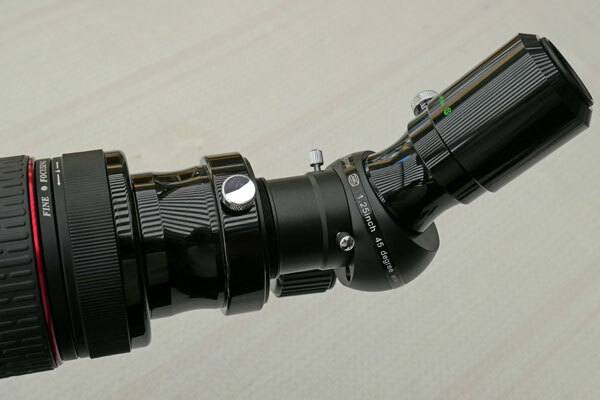 As I found out quickly, it is not alone in this respect, but on other similar telescopes a viewfinder is easier to attach because they feature a normal focuser. And what I saw from Arcturus or Mars was by no means a dot or a disk shape as I had hoped for, and perhaps expected. 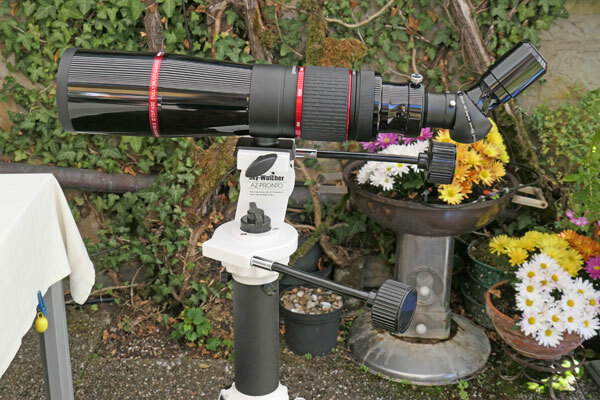 Whether this is "normal" for such a telescope, or whether mine is a "lemon," I would probably only find out in the course of time (also in comparison with the similarly magnifying Heritage 100P, see below). At least, I was able to observe a few targets in the night sky, such as M 13, M 92, M 56 (quite faint), M 31, and the coat hanger Cr 399. I found especially the more diffuse objects quite beautiful (but also small...). 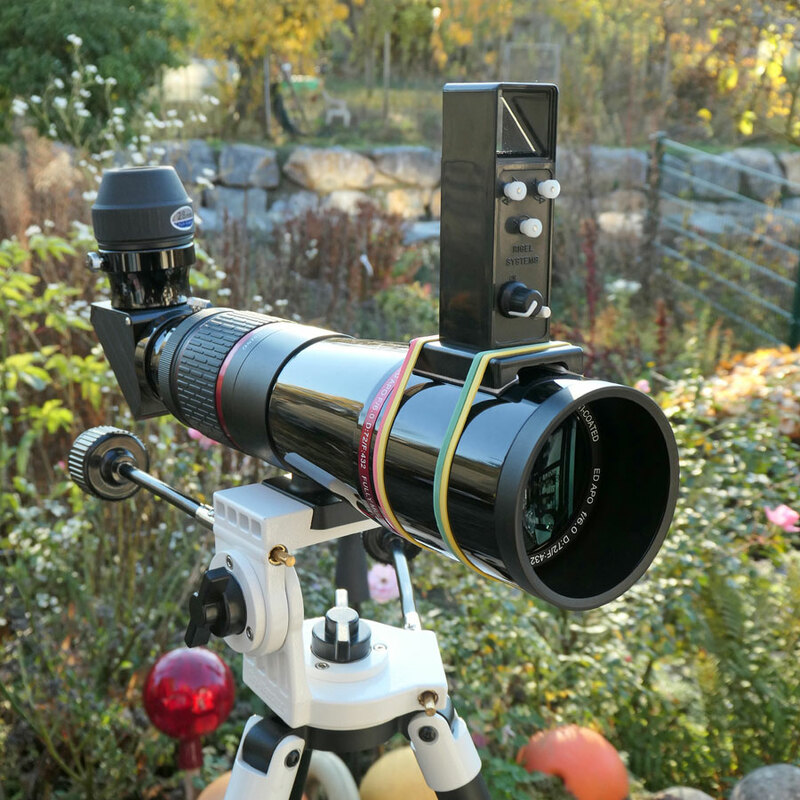 Although the "rubber band viewfinder" worked quite well, I had problems with finding some observation targets. 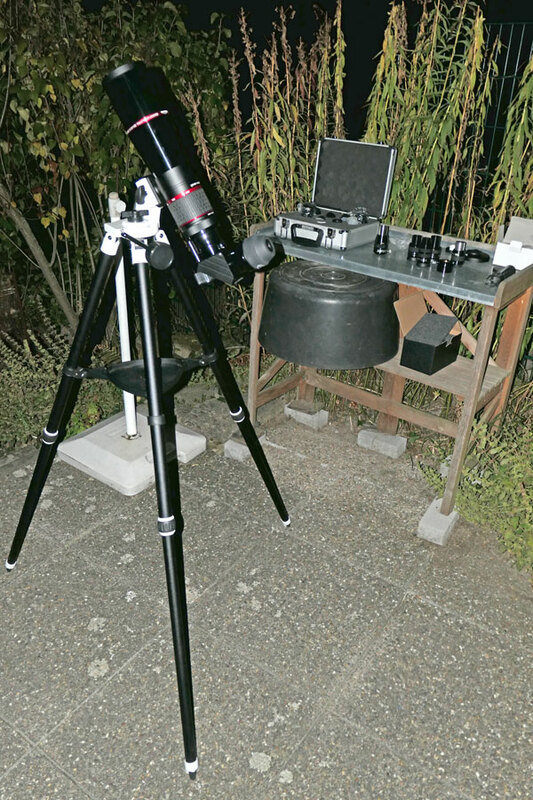 In the end, the TS binoculars helped me to locate the targets and to find them with the telescope as well. 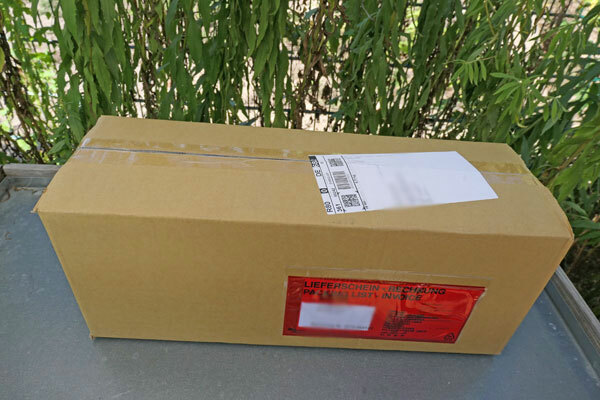 Since I wanted to go on vacation a few days later, it was now too late for further experiments with newly purchased accessories, such as a 2" zenith mirror. And thus, using the telescope on vacation, as I had intended, did not seem possible. 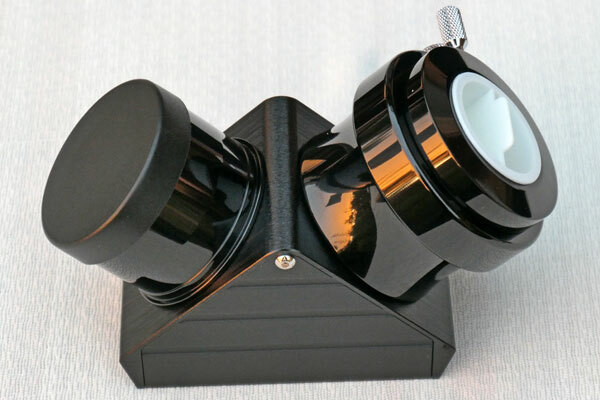 At night, I remembered that I owned another zenith mirror, which the former owner of my Skymax-127 had installed in a self-built angle finder. He had replaced the Sky-Watcher zenith mirror with a dielectric one from Lacerta - and I had made my observations with this one. 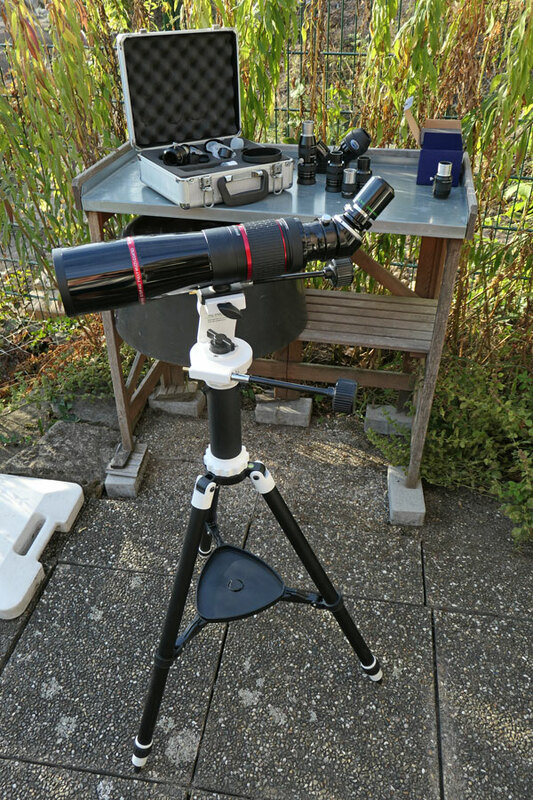 However, the angle finder was difficult to disassemble, so that I had to wait for the next morning, until I was able to "restore" the zenith mirror. 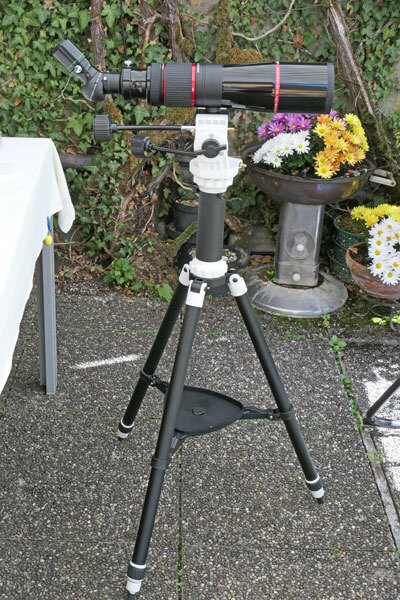 I then performed a test on terrestrial targets as far away as possible (crane, antenna) using all my eyepieces. 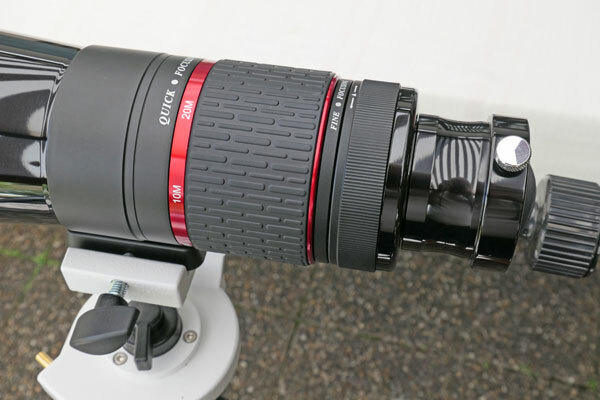 And I was pleasantly surprised: Except for the already mentioned 10 mm eyepiece, I came into focus with all of my eyepieces, however, with different focus points on the coarse focusing scale. 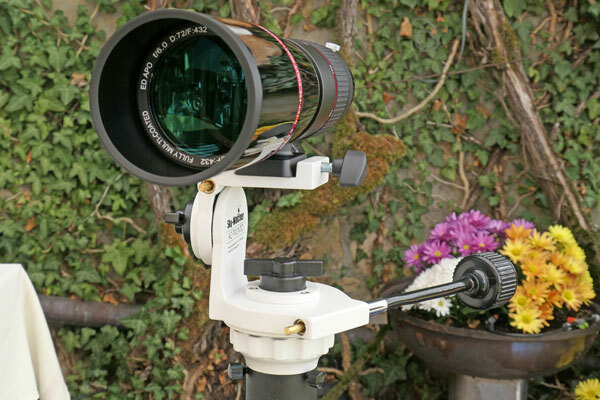 And that gave me hope that I might also get into focus with the moon, planets, and stars with these eyepieces. 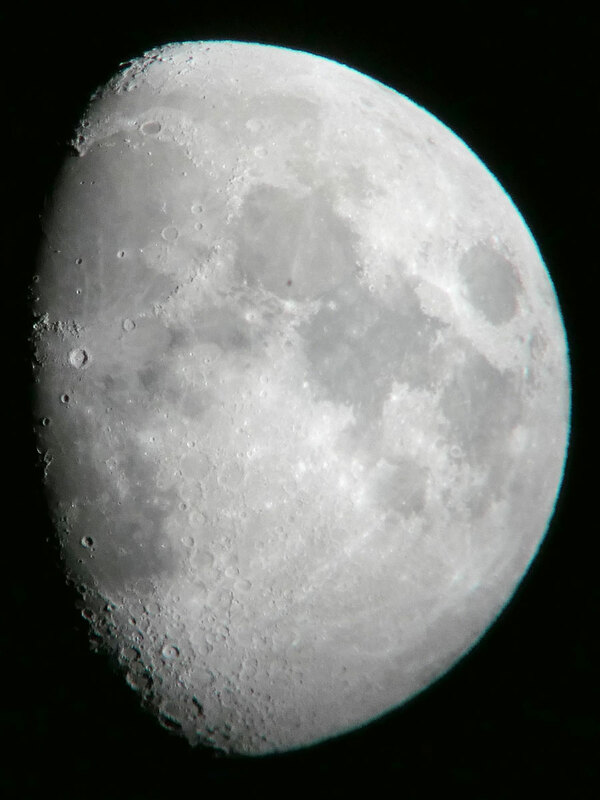 And with this pleasing result, using the telescope on vacation seemed, much to my joy, to be in reach again! 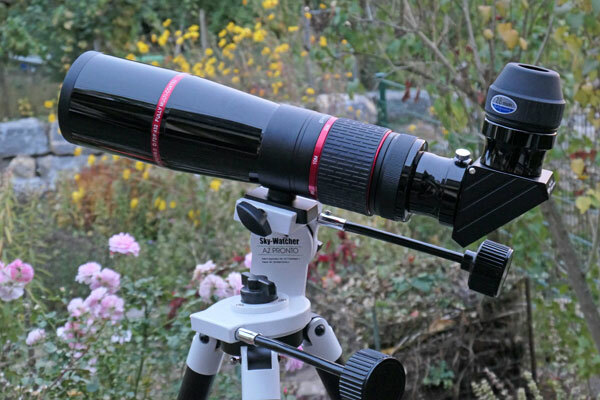 The following evening was meant to reveal whether the Omegon refractor PS 72/432 is also usable for sky observations in conjunction with the Sky-Watcher zenith mirror, if so, with which of my eyepieces, and how it compares with the Sky-Watcher Heritage 100P, which plays in a similar league. 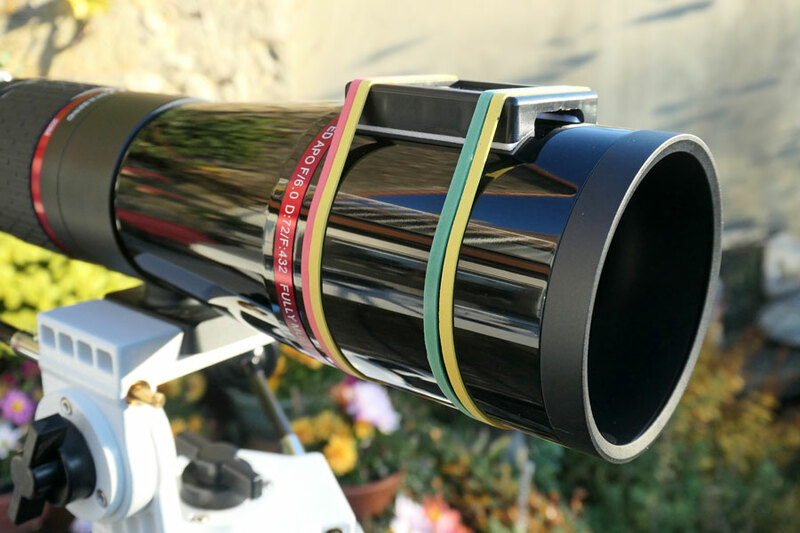 The Heritage 100P has a larger aperture, but I have read again and again that a 70 mm refractor corresponds to about a 100 mm Newtonian telescope because it has no obstruction (the numerical values found for Newton telescopes, typically do not include the obstruction; the data is based solely on the aperture). 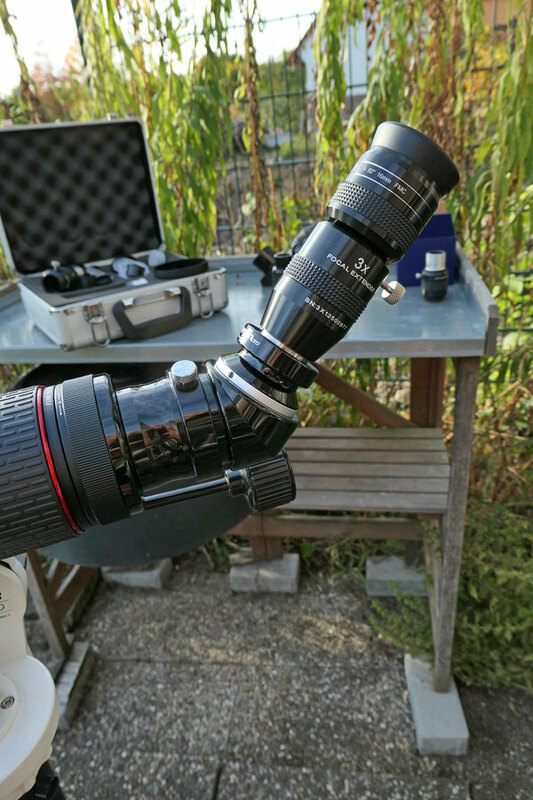 First I tested my eyepieces on the PS72, and all but the 10 mm eyepiece came into focus on celestial objects as well. Then I tested the refractor at the crescent moon (3rd day after New Moon), where the sky was still quite bright at the beginning, and compared it with the Heritage 100P at similar magnifications. It quickly turned out that the 2 x focus extender from Explore Scientific, which I needed to arrive at similar focal lengths, only came into focus on the Heritage 100P. I tested 7 mm against 16 mm with extender, and 4 mm against 7 mm with extender, whereby I always used the extender version on the Heritage 100P. 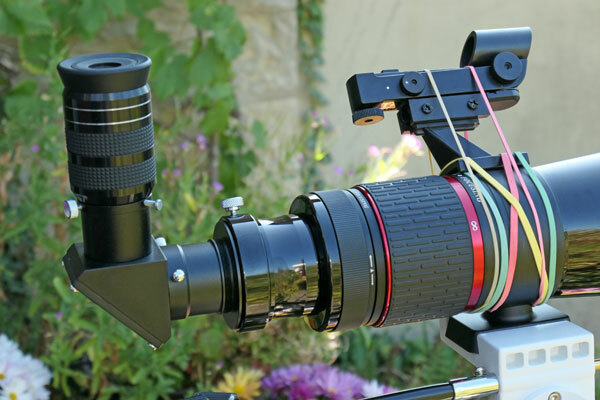 At the beginning, I also tested longer focal lengths like 24 mm and 16 mm alternately in both telescopes. Since the crescent of the moon was now a bit wider than the day before, I was able to see craters and parts of the Mare Crisium well and to judge the view in both telescopes. At low magnifications, the view in the refractor showed clearly more contrast and was sharper than that in the 100P, at 100x magnification the view seemed to be slightly brighter in the Heritage 100P, but probably less sharp than in the PS72. 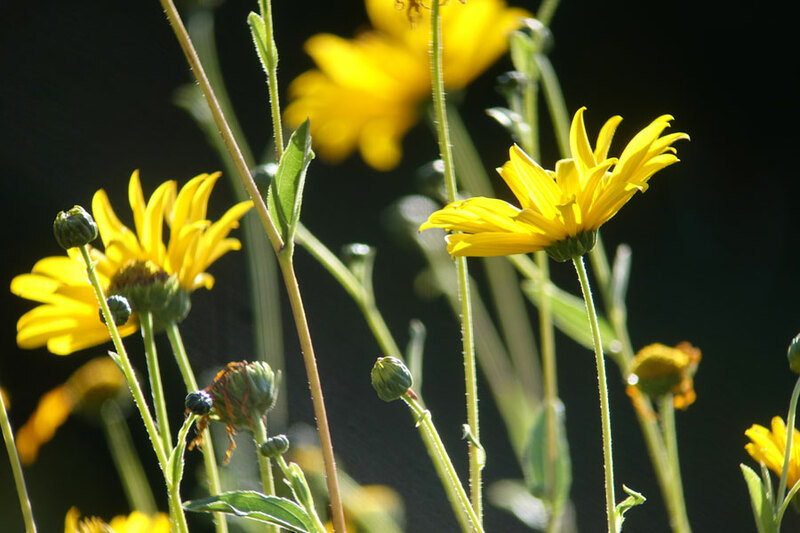 The latter might also be due to my difficulties with adjusting the focus on the 100P. 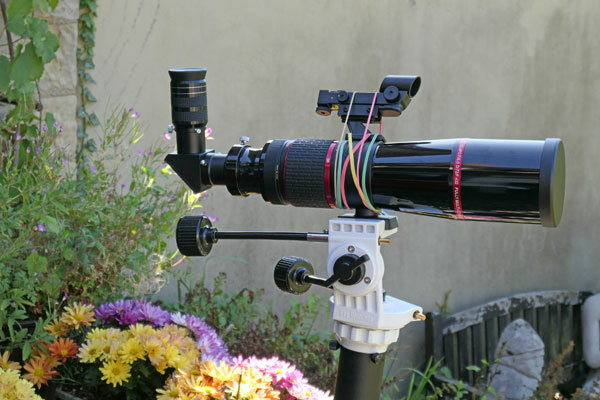 I also tested the telescopes on Mars and Saturn with up to 100 x magnification. Saturn appeared slightly sharper in the refractor, with Mars it was sometimes the same and sometimes the other way round, not allowing a clear statement. The results for the PS72 were in any case much better than my first attempts on Mars the day before. 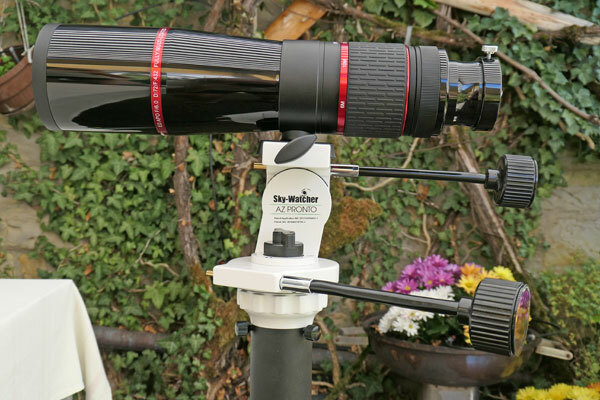 Since I now came into the focus with the refractor "from both sides," I was also able to achieve a much better image quality on stars than on the first day. Fortunately, my fears of having received a "lemon" were not confirmed. I saw this very nicely on the coat hanger Cr 399, which can still be seen completely in both telescopes: It looked nice in both telescopes (fine star points) - perhaps the PS72 had a slight edge here... The double star Double Double in Lyra was another "hard test" for both telescopes: From a magnification of about 100 x on, you should be able to see 4 stars, that is, two star pairs. 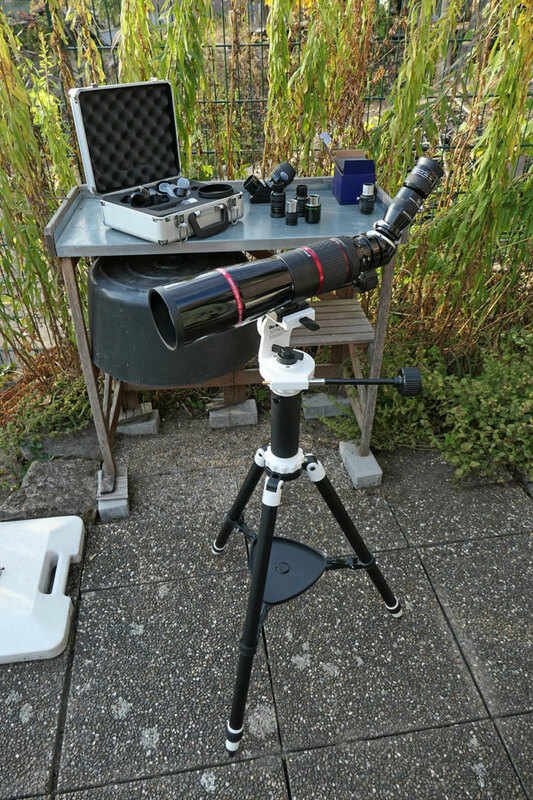 My Maksutov telescopes had passed this test well in August 2018 (even below a magnification of 100 x ), but with the Heritage 100P I had tried in vain to further resolve the two main stars in autumn 2017. This was the same again even with a magnification of 114 x! 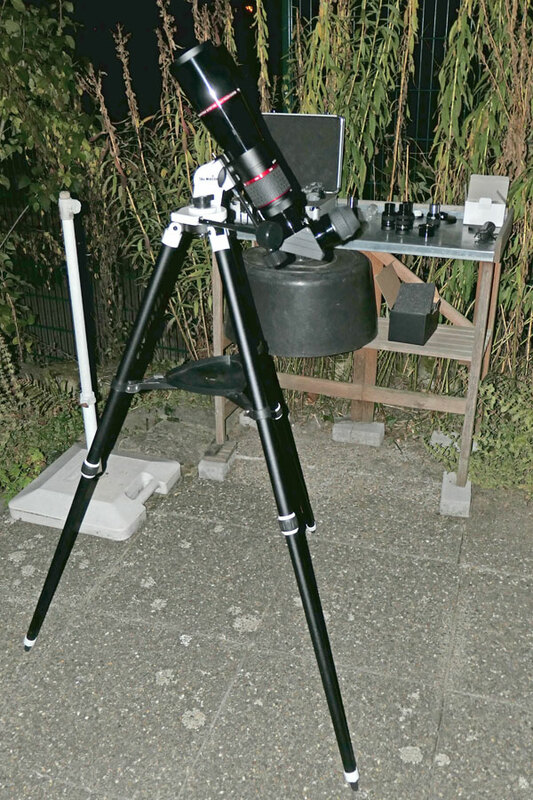 The PS72 refractor, on the other hand, was able to resolve one double star at a magnification of 108 x, and for the other one I was able to at least guess that it was a double star. I also observed a number of deep sky objects with both telescopes at different magnifications; this was less about sharpness than about brightness: M 13 (Hercules Cluster), M 31 (Andromeda Galaxy) and M 57 (Ring Nebula in Lyra). All of them were well to see in both telescopes, but the Ring Nebula was not a ring. My impression was that the objects in the Heritage 100P were perhaps a little bit brighter and perhaps a bit more extended. This would not surprise me at all, considering the larger aperture and exit pupil of the Heritage 100P (but note the obstruction...). 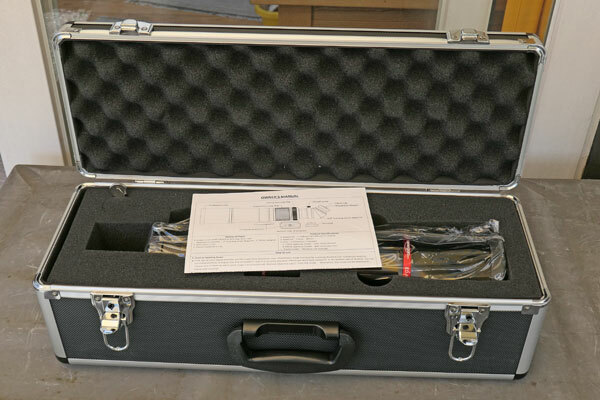 Overall, however, both telescopes delivered quite similar results. Before our vacation, I wanted to see, whether I can also find the Dumbbell Nebula M 27 with the PS72, because I had found out that it is not far away from the already visited coat hanger Cr 399. In addition, the double star Albireo is nearby, also a worthwhile target! After installing the telescopes PS72 and Heritage 100P, however, the nearly half moon was my first target, because it was still relatively bright. 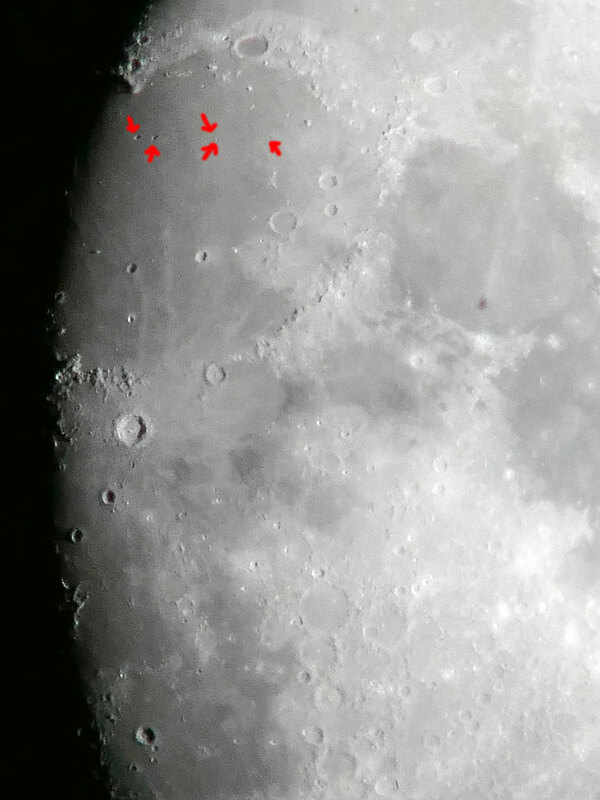 The craters Theophilus, Cyrillus and Catharina near the terminator were nice to see. 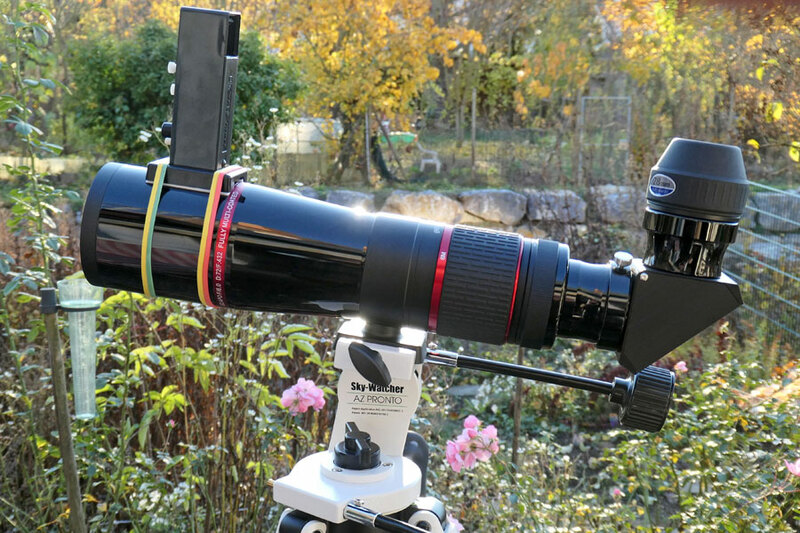 On the PS72, I increased the magnification up to 324x, at which the image looked a bit blurred, but was still acceptable (far beyond the beneficial magnification). And so it came: After using the 2 x focus extender on the Heritage 100P to achieve magnifications similar to those on the PS72 there in parallel, I this time also tried the 3 x focus extender, for whatever reason... To my surprise, it also worked on the PS72, and even with the 10 mm eyepiece. 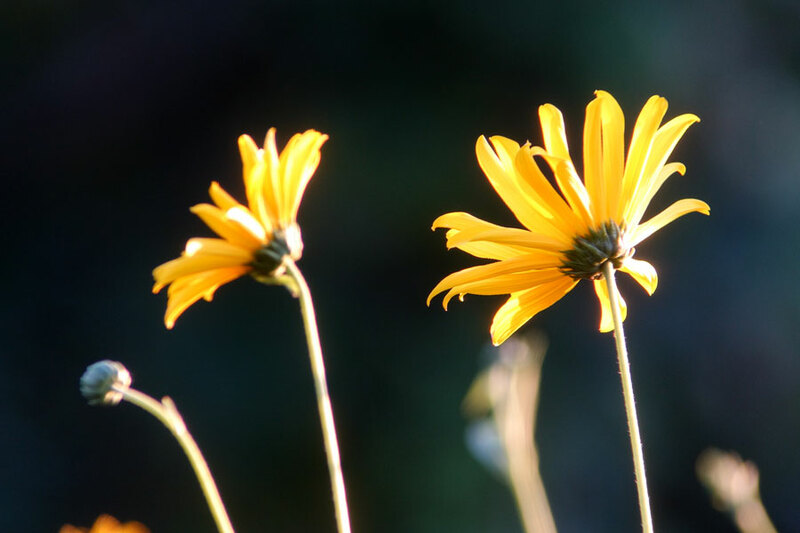 This surprise was of course a pleasant one, and so I used the 3x focus extender again and again on the PS72. 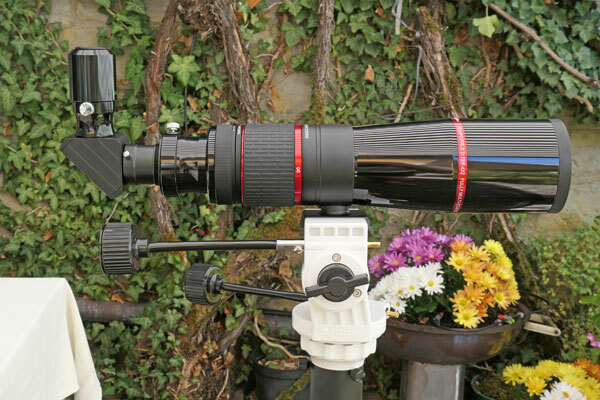 My 4 mm eyepiece with a focal length of 432 mm and the 3x focus extender leads to a 324 x magnification. 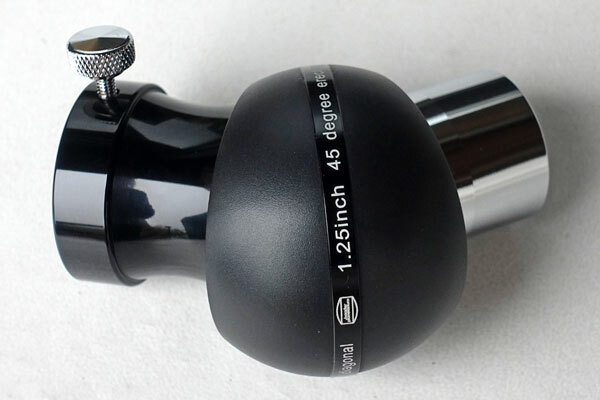 With the 7 mm eyepiece it is 185 x, with the 10 mm eyepiece it is 130 x and with the 16 mm eyepiece it is 81 x (the first three are beyond the beneficial magnification). 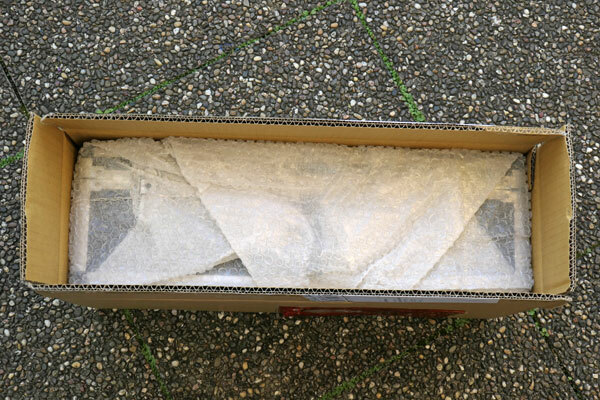 Of course, this opens up completely new possibilities! Before I ventured to the Dumbbell Nebula M 27, I first found the coat hanger Cr 399 by chance and later the double star Albireo, which could already be separated with a 24 mm eyepiece (18 x). With some effort and the help of SkySafari 6, I finally found the Dumbbell Nebula M 27, even with both telescopes, and observed it at different magnifications of up to 100 x. It was a more or less round diffuse and faint glow, but there was no doubt about the detection. Both telescopes showed a similar performance. 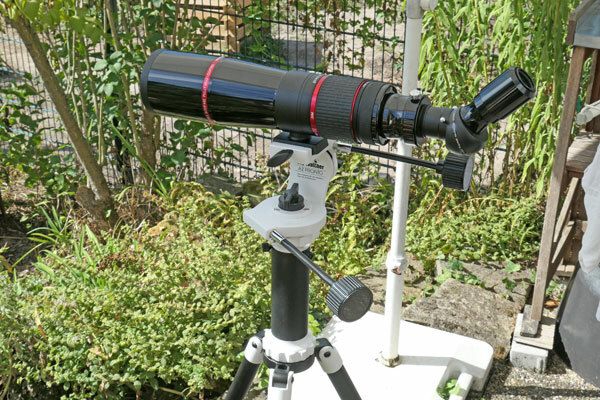 Omegon Amici Prism 45° 2'' to 1.25"
Photos: Omegon Amici Prism 45° 2'' to 1.25"
The next day, I tried all my eyepieces, as well as my focal length extenders with some eyepieces. 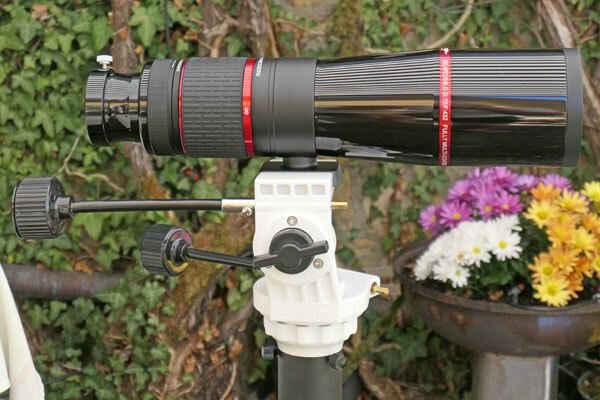 At a distant target (about 100 m) all eyepieces/combinations came into focus. 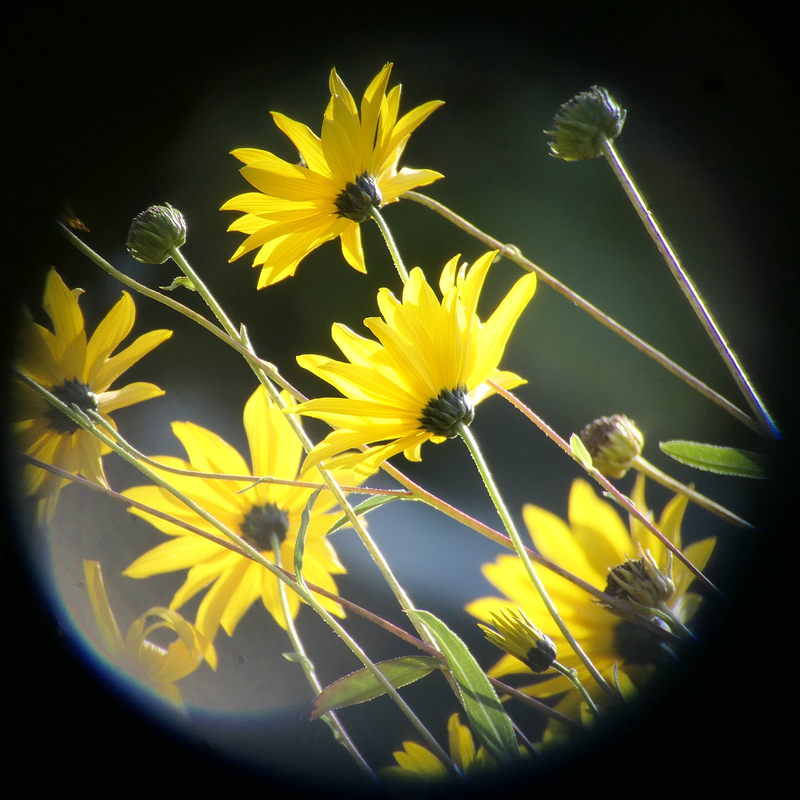 At a near target about 8 m away, I had to pull out some eyepieces a little to get into focus. All in all, this is a very satisfying result! 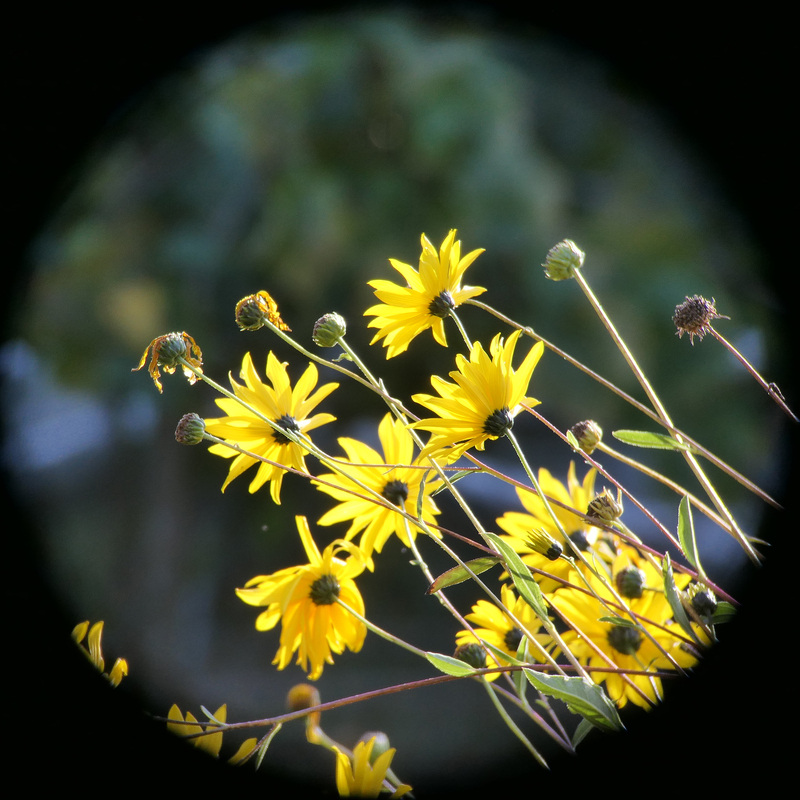 I also tested my eyepieces and focal length extenders with the 2" zenith mirror. 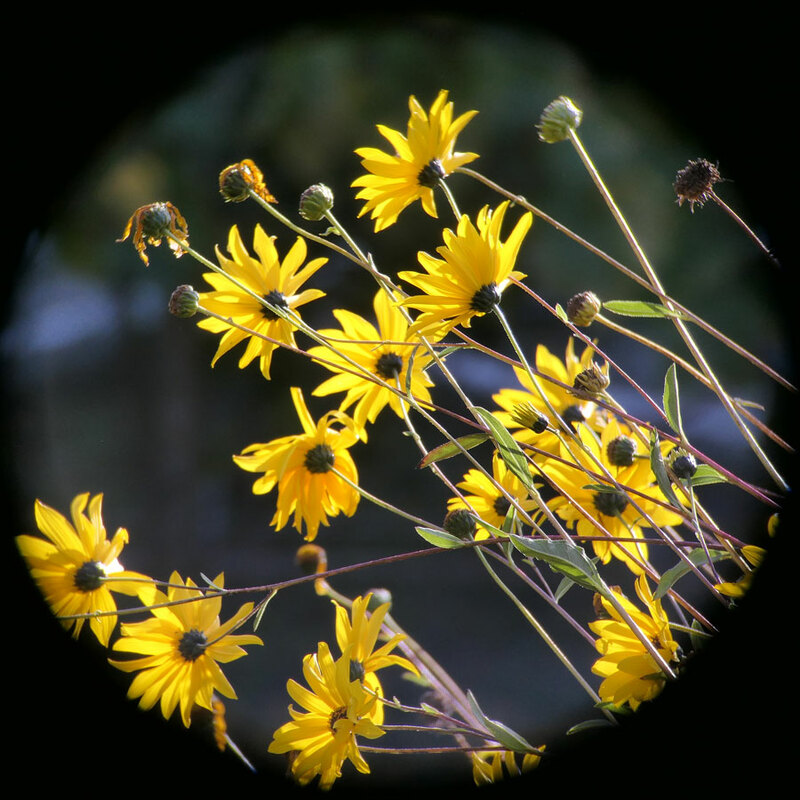 With the exception of the 10 mm eyepiece from University Optics, every eyepiece came into focus. 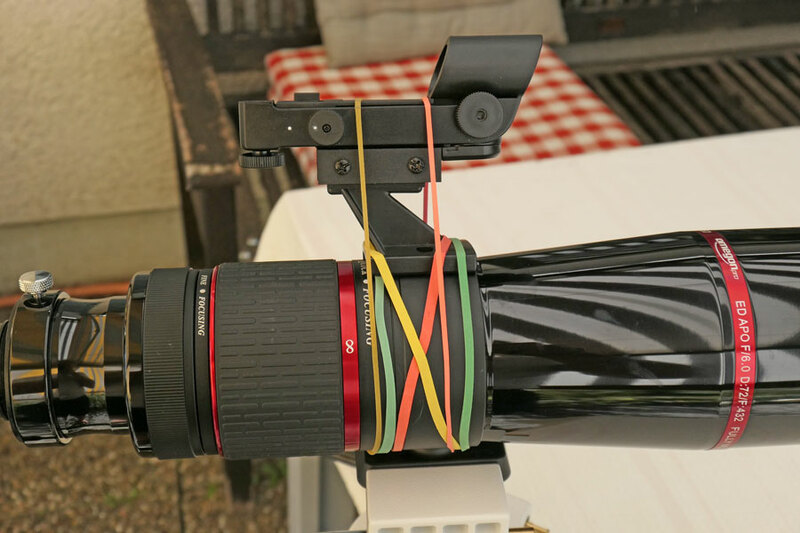 With the latter, this was only possible with the 3 x focal length extender. 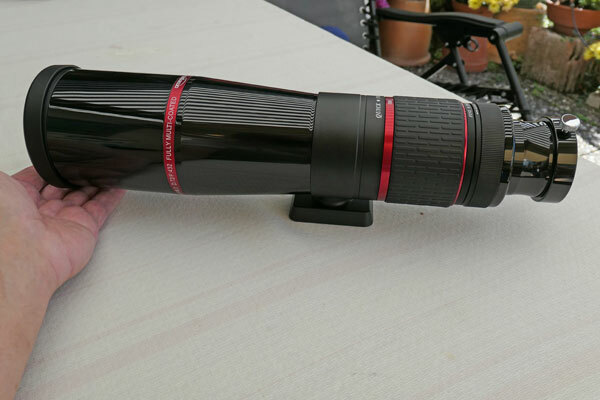 As it turned out, the extension for the 10 mm eyepiece is too long - and not, as usually, too short. 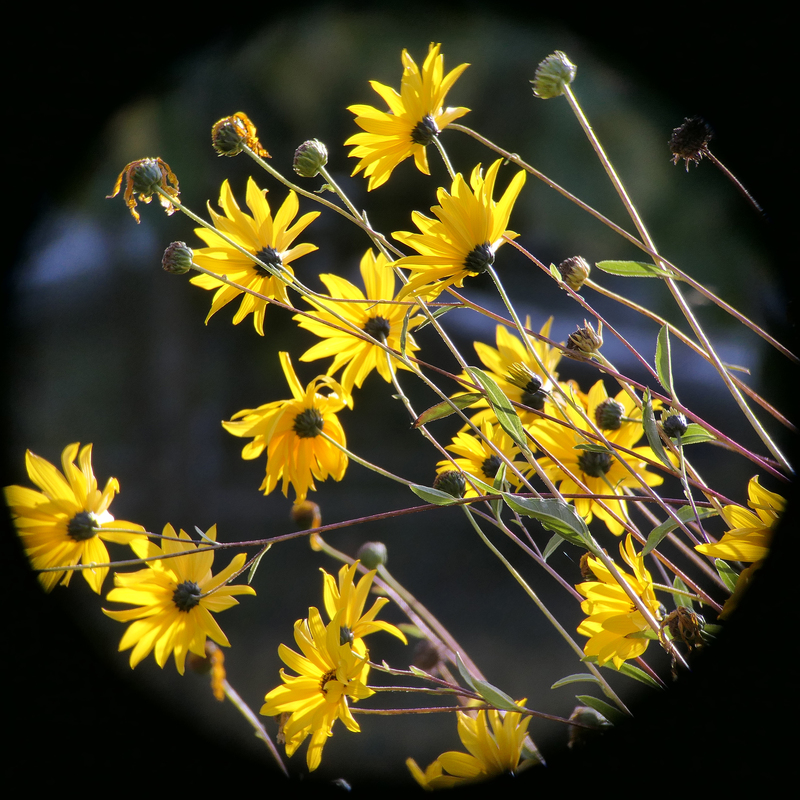 This eyepiece is generally somewhat special when it comes to focusing. 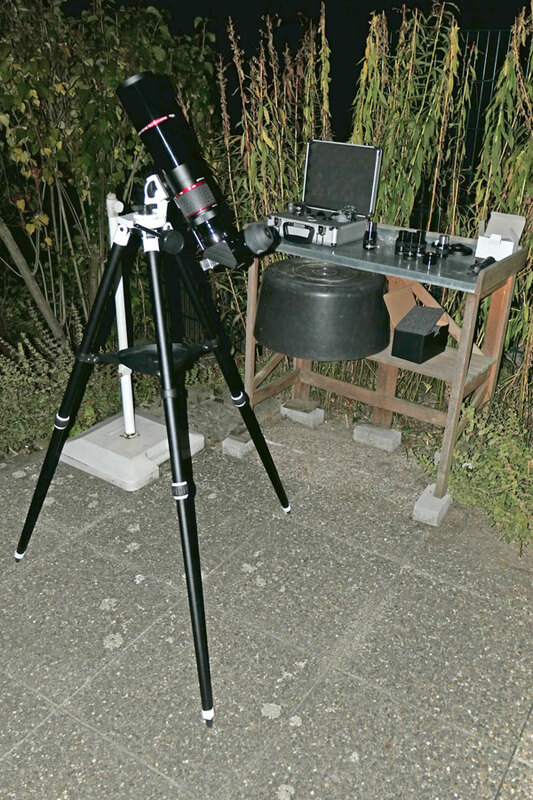 Overall, I was also satisfied with this results and will now only use the 2" zenith mirror on this telescope. 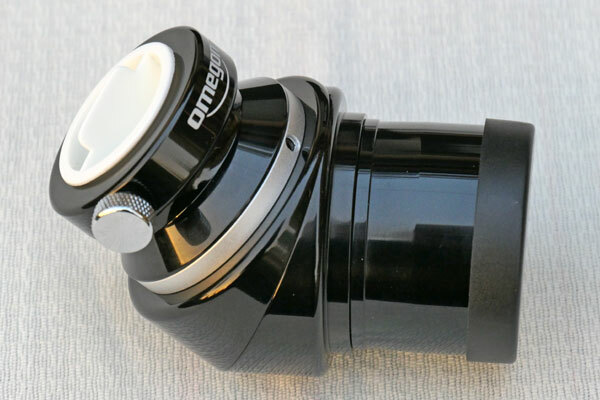 For overviews, I can now use the 28 mm eyepiece (probably an Erfle eyepiece) from my Sky-Watcher Explorer 150PDS. 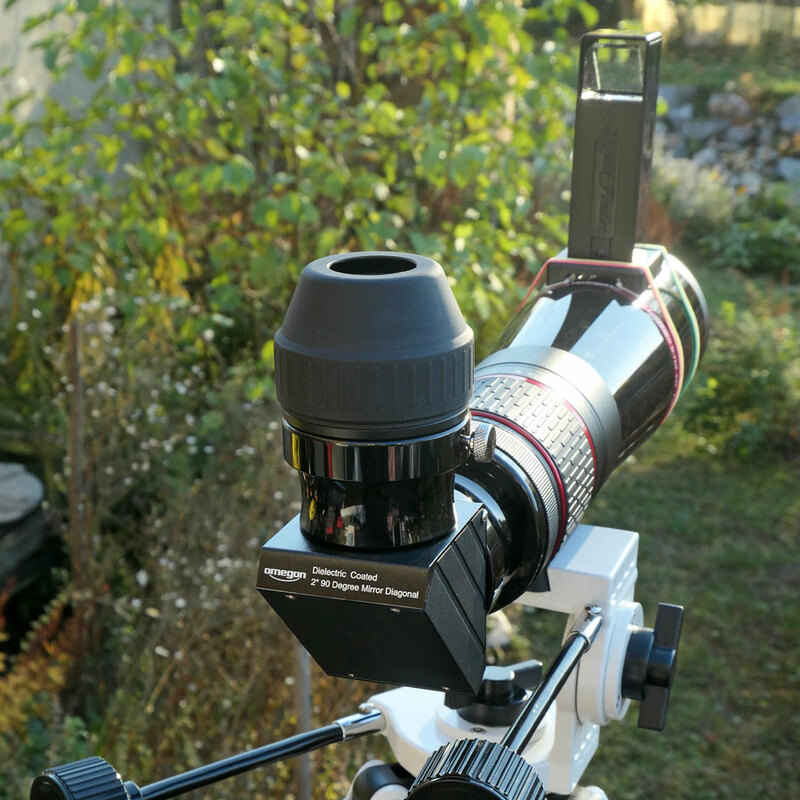 It provides about the same field of view as my 32 mm Plössl eyepiece, but at a slightly higher magnification (during the day, it also shows a lower depth of field than the Plössl eyepiece). 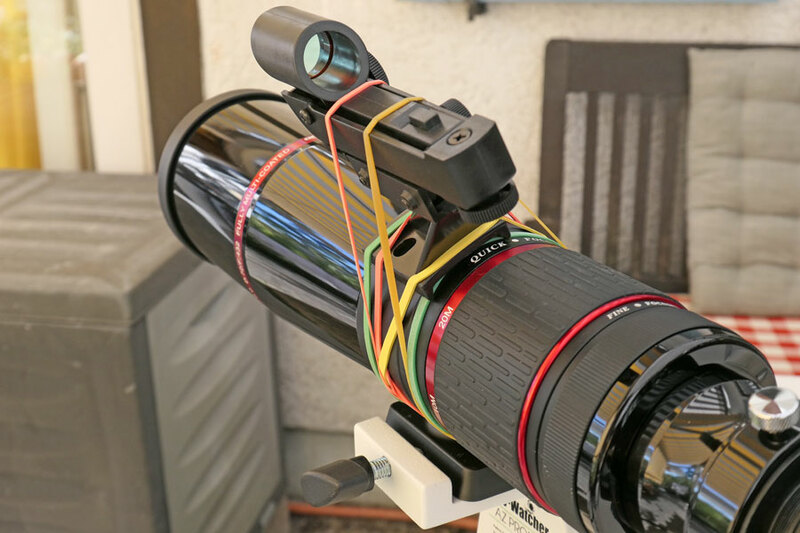 At first, I just attached the Rigel finder to the telescope tube with many thick rubber bands. This might have worked during an observation session, but sometimes it did not even that... And above all, the finder had to be adjusted at every new session. That was annoying in the long run! 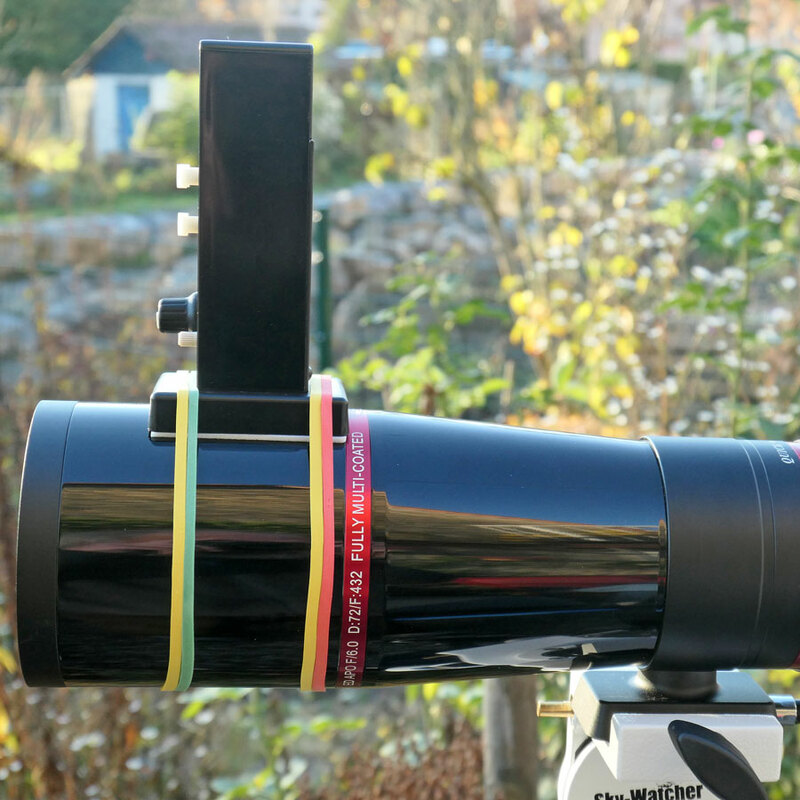 So I decided to fix the base plate with the help of the supplied double-sided adhesive tape, hoping that it would remain firmly on the tube when packing the telescope away into its suitcase or bag. This has worked so far, but how long it will last is, of course, open. 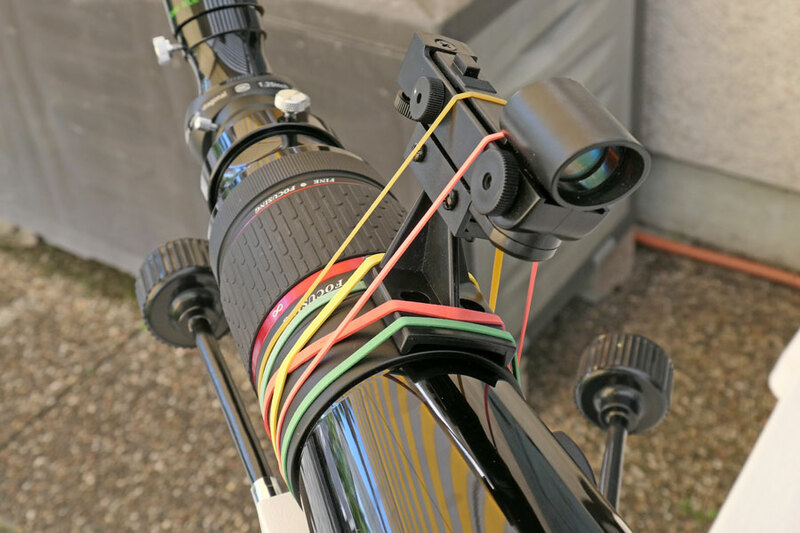 Furthermore, I found a disadvantage of the large distance from the viewfinder (which is at the front of the telescope and I am behind it): the two red rings appear very large on the mirror of the viewfinder. At least both rings are still visible! 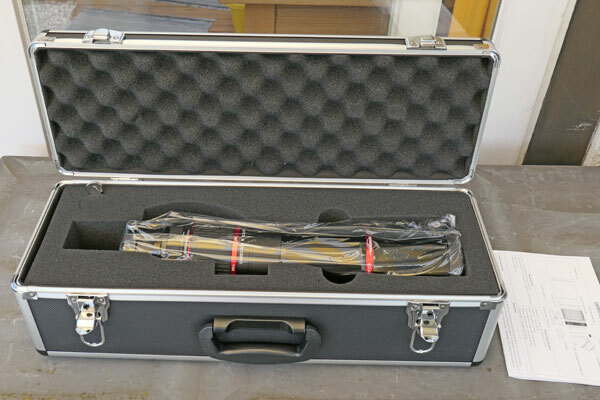 In addition, the technical specifications include some values of a telescope with 66 mm aperture (exactly: 66.5 mm): these include the resolution, light collection power, and limiting visual stellar magnitude (for a comparable 72 mm telescope, the data is correct...). 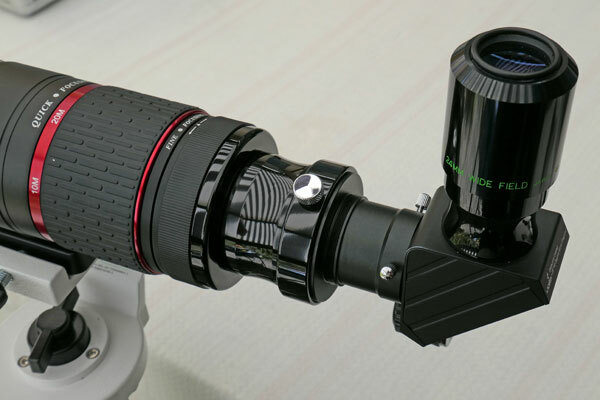 Since there is a similar telescope with 66 mm aperture, I suspect that the data was simply copied from there. I also tried to clarify this in another phone call and was promised that my suggestion would be forwarded. Regardless of whether the data will be corrected (this has not happened up to now, and probably never will), I will use the values calculated by me (or those of the other telescope with 72/432) from now on. 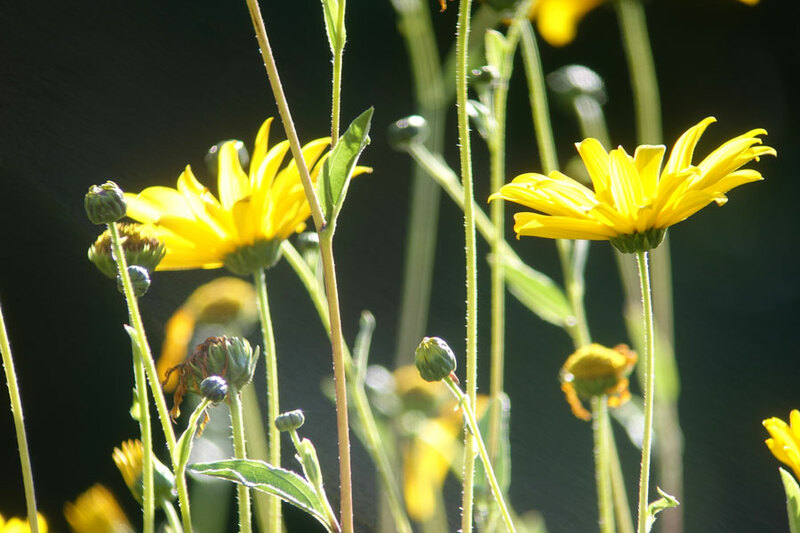 After my first "spotting scope" tests, I quickly tried to take a few photos of the sunflowers in our garden using the 32mm eyepiece with T-mount thread and my Sony RX100 M4 screwed to it (using a focal length of 70mm equiv.). Since it was windy and I did not use a remote release, I had little success. Later, when there was less wind, I had another try (second row). This time, I used a cable release. 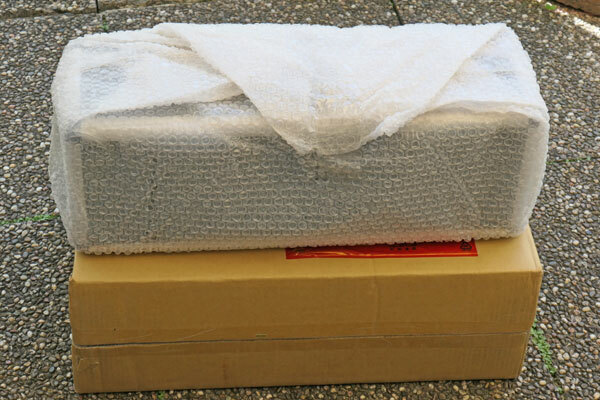 The two best images that I got are shown here; they were postprocessed. 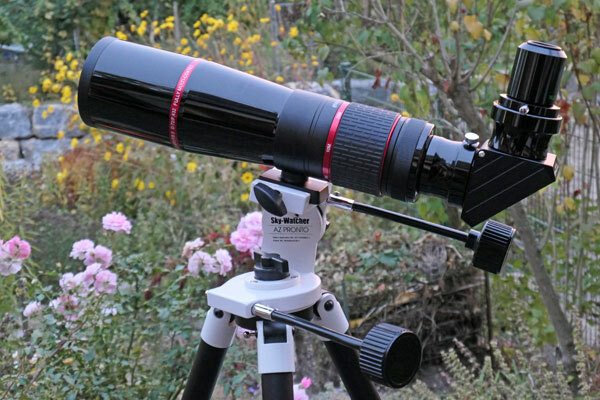 All in all, it does not seem to be easy to get sharp photos with the telescope, particularly due to the narrow depth of field. 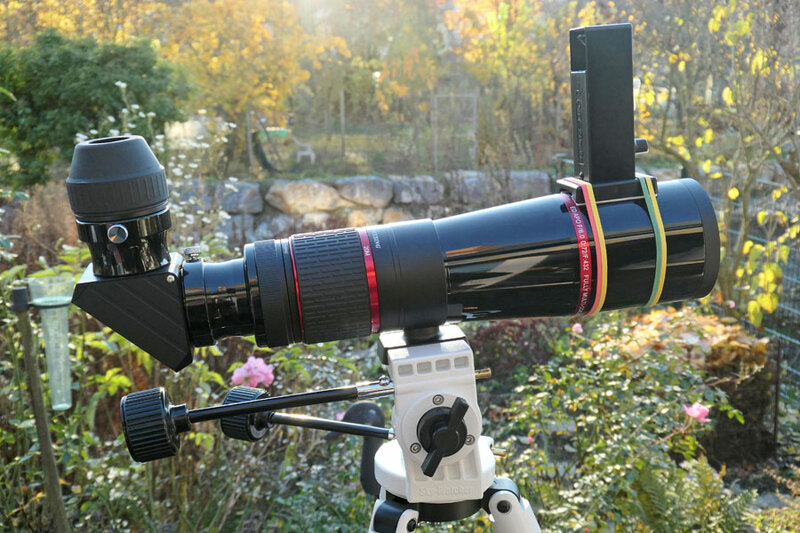 In mid-October 2018, I made photo attempts with the new 2" to 1.25" Amici prism from Omegon. Here are some example photos! Overall, the picture quality seems to be better this time (the depth of field is very low, though...). Overall, there are blue color fringes, particularly at the edges of the moon. In addition, because of its noise behavior, the Panasonic TZ202 does not seem to be an ideal camera for astronomy photos. The second series taken with a focal length of 28 mm turned out to be more fuzzy for unknown reason. Using the presented sample from the 24 mm series, I looked for some small craters to estimate the resolution of the photo. With some good will, a crater of 5.1 km diameter is visible (Le Verrier B), but a more realistic estimate for the smallest visible craters seems to be a diameter of around 10 km. There are, however, craters of this size that are not visible on the photo, probably due to air turbulence. Overall, this result is in line with what I have achieved with other telescopes and cameras. 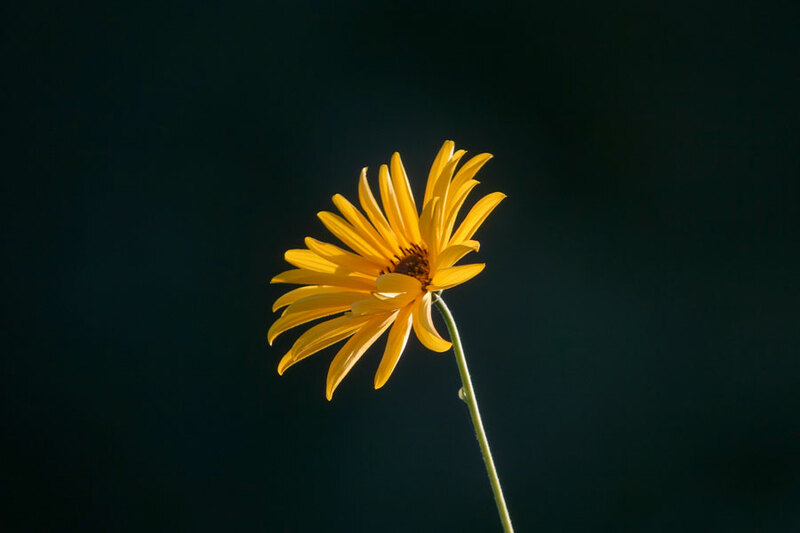 After the first three observation nights (September 2018) and a vacation (September to early October 2018) I might try to draw a first, preliminary conclusion. 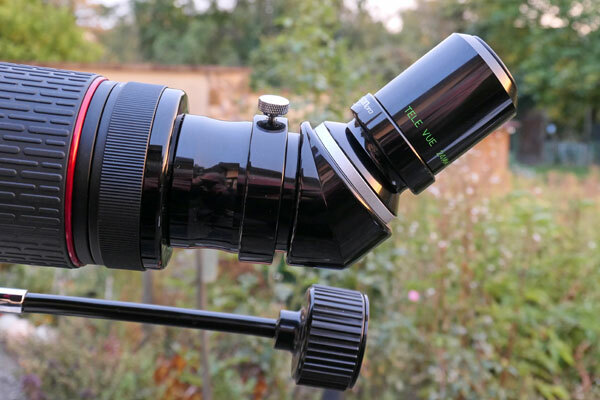 After overcoming some obstacles and problems, which were mainly caused by an unfavorable interaction of zenith mirror, 2" to 1.25" adapter and my eyepieces, I managed to establish a "workable" configuration with a simpler zenith mirror, in which even my triple focus extender plays a role (and, with it, my 10 mm eyepiece). 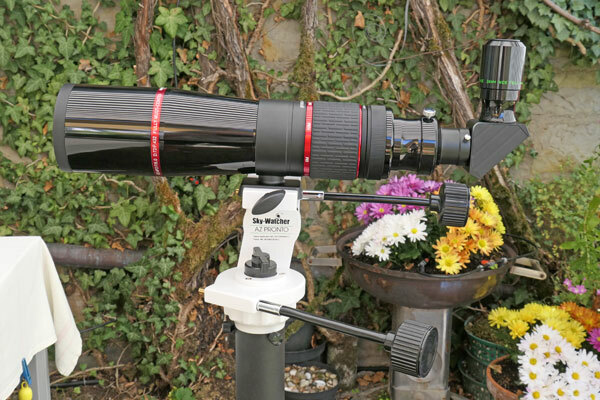 Unfortunately, the Sky-Watcher adapter from 2" to 1.25" does not sit safely in the 2" eyepiece holder, so that, back from vacation, I bought a 2" zenith mirror with a corresponding adapter to 1.25". 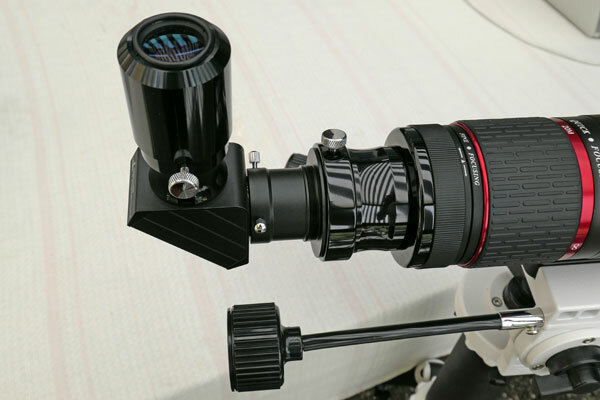 This sits firmly in the eyepiece holder, so that I have no problems with it. 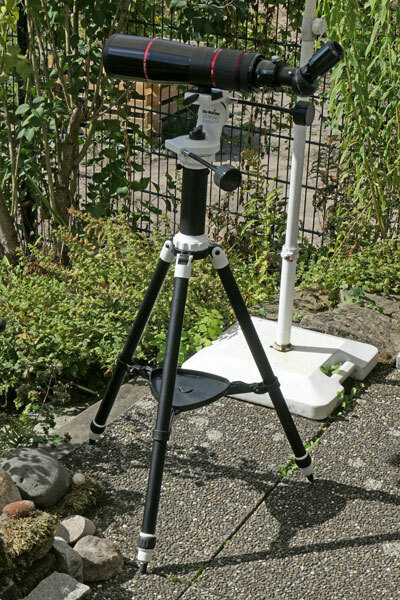 For terrestrial observations, I also purchased a 2" Amici prism that adapts to 1.25". If I can focus the image, which is sometimes a bit difficult (see below), I get very satisfying results: Stars are nicely dot-shaped, details on the moon well resolved (better than on the Heritage 100P), and I see deep sky objects almost as well (or as well) as in the Heritage 100P. In the meantime, I have been able to observe quite a number of DSOs, especially on our autumn vacation in 2018 and in winter 2018/19. The feared-for color fringes may be present, but they do not bother me up to now. Their extent depends certainly on the observation subject and the magnification used. 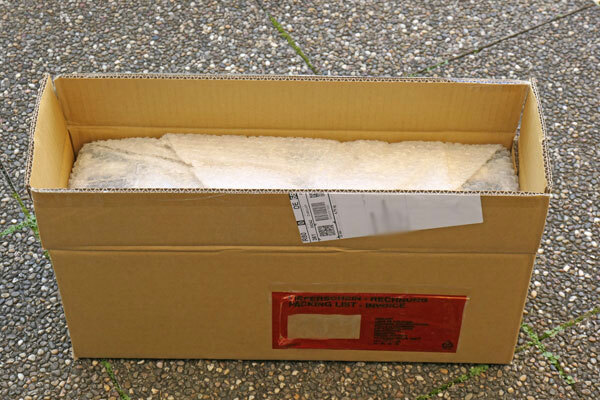 In addition, they become the smaller, the more exactly one focuses. In the meantime, I have found visually yellow and photographically blue color fringes on the moon, especially at the edges. 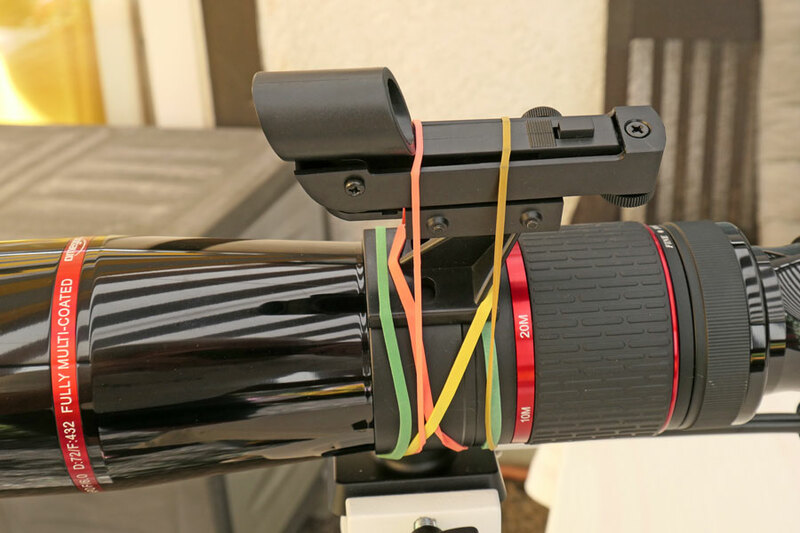 Shortcomings are, in my opinion, (1) the missing viewfinder shoe, which I work around at the moment with a Rigel finder that is glued to the tube and a "rubber band construction," and (2) the helical focuser. The latter is quite stiff, especially the fine adjustment ring. 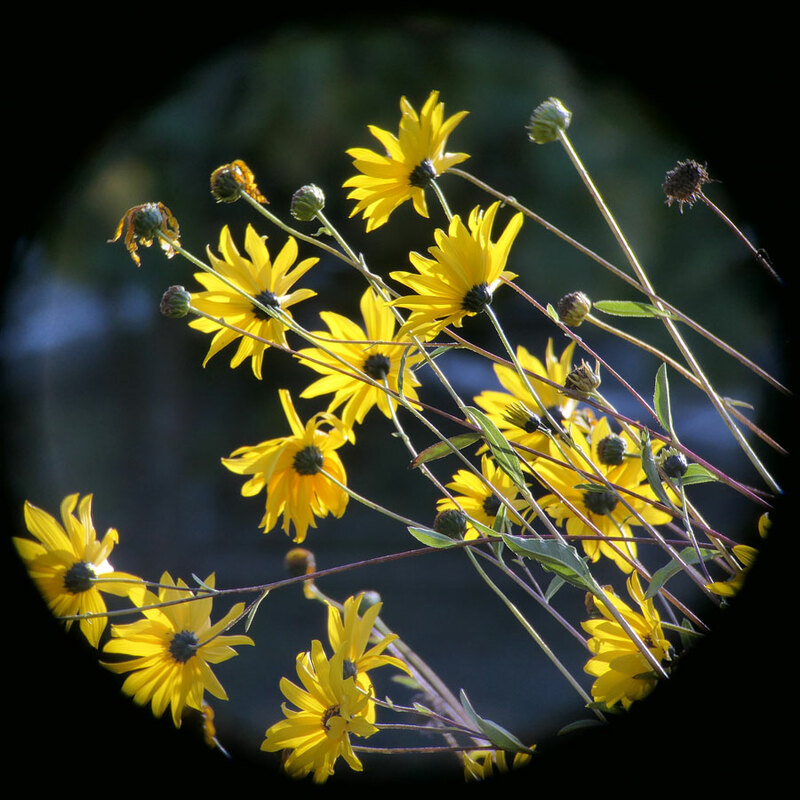 Sometimes, the focuser seems to lose "orientation," and I have to start focusing all over again. With the coarse adjustment, the rubber armoring sometimes seems to slip (or the focuser itself slips...). I also found a distinct hysteresis in the fine focuser, which makes focusing accurately nerve-straining. 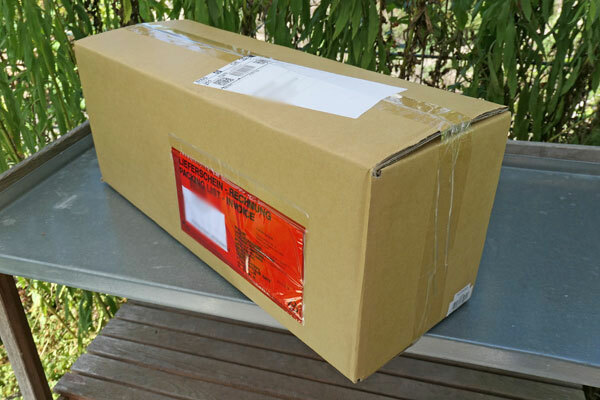 After contacting the dealer, I received a return note and returned the telescope for exchange or repair. 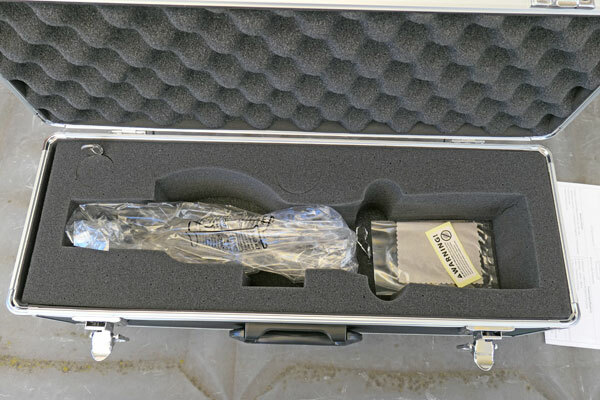 After some time, I was notified that the telescope was "within the tolerances" and whether I wanted it back or a voucher instead. I was disappointed by this result, but decided to have the telescope returned because it seemed too cumbersome to me to exchange it for another model, given the work that I had already invested in the telescope. 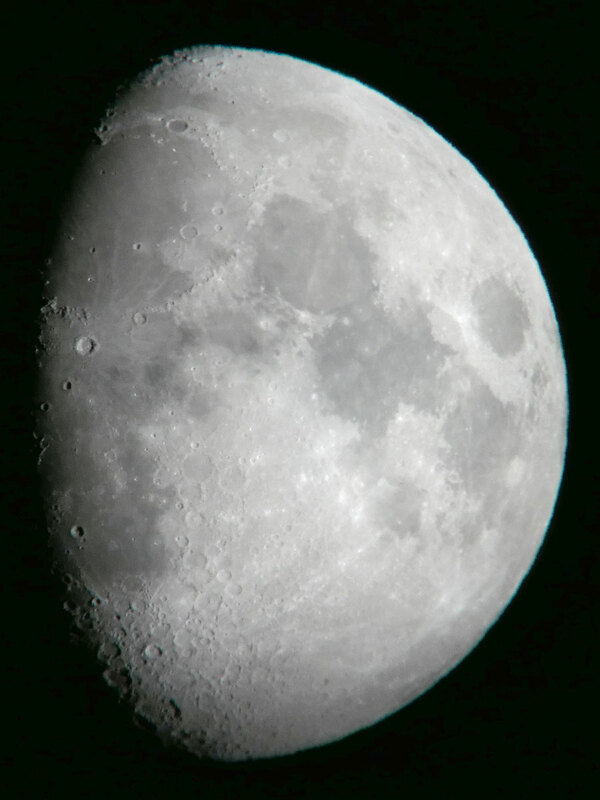 The telescope arrived in mid-November, and shortly after, I already took a lot of satisfying photos of the moon.